As reported earlier USAC and NABO excitedly partnered on the Carmelo Urza Scholarship for students to study abroad on either its Bilbao or Donostia programs. The first deadline to apply for the scholarship for those planning to study abroad in the fall, was April 1st. Now it is our pleasure and honor to announce that the winner of the first ever Carmelo Urza Scholarship is Kali Kester. Kali is from Battle Mountain, Nevada and a member of the OberenakBasque Club. 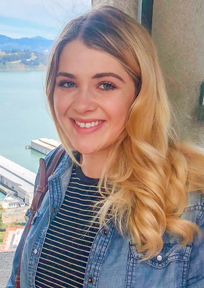 She participated in Basque dance from the age of 5 on, and is now attending UNR pursuing a double major in Community Health Science and Spanish. Her plan is to spend the 2018-19 school year between Donostia in the fall and Alicante in the spring. She is excited about the prospect of becoming entirely immersed in both the Basque and Spanish cultures. Besides taking a full load of classes, she also hopes to become involved with a local Basque dance group there. In her words, “I am so incredibly honored to be receiving this scholarship because the Basque community and culture have been such an influential and important part of my life.” Zorionak Kali! Deadline to apply for the scholarship for Spring 2019 is November 1st. The application is available here.